This post contains affiliate links, which help support this website, at no additional cost to you. For my full disclosure policy, go here. Memorizing verses from God’s Word was one of the first disciplines I adopted as a young believer many years ago. I had wonderful older believers who were pouring into my life in that season, and Scripture memorization was high on their list of things I needed to do. 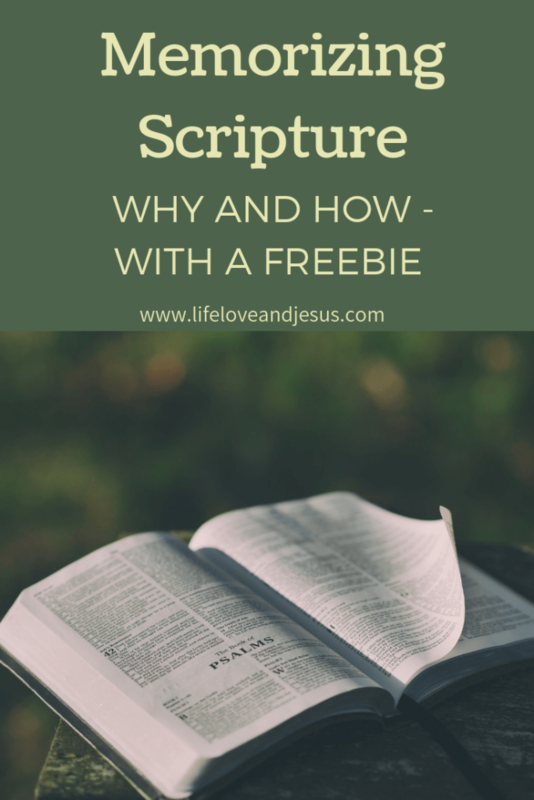 Later, I attended a one-year Bible Institute where we were expected to memorize a minimum of one verse of Scripture every week – including on school breaks! My repertoire of memorized verses grew quite large. After leaving that school, and long after losing contact with my early mentors, I continued to memorize the Word of God. I have never regretted the time or effort spent on memorizing Scripture. I have never known anyone who memorized the Word who has regretted it. Having the Word hidden in your heart is like having part of the Bible you carry around with you always – and that the Holy Spirit can always call to mind when most needed. I think every believer should engage in this vital practice of Scripture memory. But I know it can be challenging. Even the pace of one verse a week can be too daunting to some people. If that’s you, I encourage you to do two things: First, commit to Scripture memory even if it’s only one verse a month. In five years, you will have memorized 60 verses. Second, reconsider your to-do list. If God’s Word is being squeezed out, then something else must go in order to squeeze it back in. I will be 56 this month. It is no longer as easy for me to memorize Scripture as it was years ago. But I persevere because I believe in the value of this practice. No matter your age or stage of life, challenge yourself to memorize something consistently, even if it is only one verse a month to start. You might also be interested in this post. Or this resource. There are, of course, apps to help you memorize Scripture. I don’t use any of them – although I tried ScriptureTyper for a while. I think the twin pillars of old-fashioned memorization work best with our brains’ wiring. I encourage you, therefore, to use these two foundational practices: saying the verse out loud and writing the verse down. However, if you’re a techie person and want an app to try, here are three to check out: ScriptureTyper, Verse (iOS only), and Fighter Verses. Start by saying the verse aloud to yourself several times a day – reading directly from the card where you’ve written or typed it. Repetition is the key. While you are saying the verse, don’t forget to say the reference. For example, if you were memorizing the first verse of the Bible, you would simply repeat the phrase, “In the beginning, God created the heavens and the earth” several times, along with the reference of Genesis 1:1. Once you have the verse fairly well memorized, start taking the time to write it down. The process of writing helps to transfer the verse from short-term memory to long-term memory. You can keep it interesting by writing it in a journal, with different color pens, with markers, or even with crayons. I don’t care what you use, just use something! Writing out the verse you’re memorizing is a crucial step. The final step, and perhaps the most overlooked and important step, is to review the verse repeatedly. If you are on a pace to memorize a verse each week, you would spend seven days memorizing one verse. The next seven days, you would memorize the second verse and review the first verse. The third week, you would memorize your third verse and review the first and second verses. And so on. You should review verses on a consistent schedule for at least a month after memorizing them to get them locked into your brain. After that, a less-frequent review schedule (once every month or two) can be undertaken. I love ScriptureTyper’s interface for reminders of verses to review! To make this task a bit easier, I am committing to creating 4 Scripture memory cards every month. These cards will be available in the Resource Library as a PDF file. They will be available in two formats: all four verse on one page (about the size of an index card), and each verse on its own full-sized (8.5 x 11 inches) sheet. Genesis 1:1 – which lets us know that God exists, that He is before all and above all, and that He is connected to His creation. John 1:1 – which tells us that Jesus has always been and always will be; that He is equal to the Father and separate from Him all at the same time. John 1:14 – which gives us the blessing of knowing that Jesus, who is fully God, also is fully human, that He willingly forsook heaven to become a man, so that we could gain heaven in His name. John 3:16 – the heart of the Bible tells us that God loves us more than we can ever comprehend; He loves us so much that He willingly gave His Son to be our Savior. These four verses lay a foundation of belief that will uphold the faith you build on it through time in God’s Word. Don’t forget to get your free verses in the Resource Library! I’ve done this before, but need to start up again. Thank you for the encouragement!